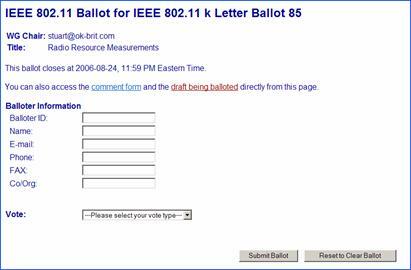 These instructions apply only for IEEE 802.11TM Letter Ballot 104 (LB104) which is a technical vote on Draft 2.0 of the Task Group “y” amendment to the current IEEE 802.11TM standard. This is a New Process we will be using to vote on letter ballots. It is a web based process similar to the process used for sponsor ballots. DO NOT send an email to vote or your vote will be invalid. This is a recirculation letter ballot and the voter’s pool for this ballot is the same voter pool that was used for the original letter ballot that passed the 75% threshold for IEEE 802.11TM y, i.e., Letter Ballot 94. If you have voted on LB 94, you are not required to vote on this ballot. Your most recent ballot will be carried forward. If you wish to change your vote, you must respond to this ballot. The ballot opens April 19, 2007 at 23:59 Eastern Time USA and closes 15 days later on May 4, 2007 at 23:59 Eastern Time USA.